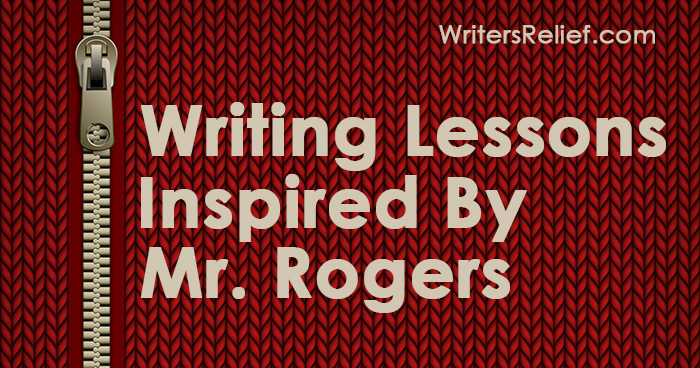 Writing Lessons Inspired By Mr. Rogers | Writer’s Relief - Writer's Relief, Inc.
March 20 is the birthday of beloved children’s television show host Mr. Rogers. Countless fans learned valuable lessons from Fred Rogers throughout the years. And while his show was geared toward children, at Writer’s Relief we feel that adults can learn from his teachings too—including writers! Here are a few writing lessons inspired by the words of Fred Rogers. Enjoy, neighbor! The publishing world can be brutal. Writers face rejection day in and day out, so it’s important that we all make an effort to treat others with kindness—even when giving a critique. Support your fellow writers by offering constructive feedback and encouragement! A kind word can erase the demotivating effect of a hundred rejections. And on a day when you’ve stepped ankle deep in a puddle, spilled coffee all over your favorite shirt, and received an umpteenth rejection from a literary agent or editor—don’t vent your frustrations by replying with an angry email. Take a breath, put on a dry pair of socks, and remember how important it is not to burn your bridges. You never know who knows whom in the publishing industry. Every writer knows that feeling of dread associated with sitting down to write, only to be confronted with a blank page and no idea where to start. But the fact of the matter is, writers can’t expect to grow if they only write when it’s easy. When writer’s block strikes (and sooner or later, it strikes every writer), use it as an opportunity to try something new. Use writing prompts, try writing in a different genre, or move to a different location. Shake up your muse and you’ll be writing again in no time! The writing life may seem like a lonely one—often it requires that you sit alone in a room, ruminating over your work for hours or days on end. However, just because you write in solitude doesn’t mean you shouldn’t also connect with other writers, family, and friends. Meet other writers by joining a writing group in your area or online. And be sure to take a break now and then to grab dinner with your friends or watch a movie with your kids. Remember, you have a story in you that no one else can tell. When you’re feeling low about your success as a writer, keep in mind that a reader somewhere will be grateful that you’ve shared your story, essay, poem, or book. You have everything you need to succeed—all you have to do is believe in yourself! Question: Which is your favorite quote from Mr. Rogers?